Calcium Malate-Chelate by Designs forHealth works great! I feel great when using Calcium Malate by Designs for Health. My nutrition recommended Calcium Malate Chelate for extra calcium. Research has shown that the vast majority of American adults do not get nearly enough calcium in their diets. Calcium deficiencies are usually even more common for those maintaining a vegetarian or vegan diet. The Recommended Daily Allowance (RDA) for calcium is between 1000 and 1200 mg for everyone over the age of eight. For this reason‚ many doctors may advise patients to start taking a calcium supplement. A quick comparison of the many calcium supplements available on the market will reveal obvious differences—it will also show that Designs For Health’s Calcium Malate Chelate is one of the best. Calcium offers many benefits. Most notably‚ your body uses it to help keep your teeth and bones healthy and strong. However‚ the mineral is also involved in nerve signaling‚ proper heart function and the contraction and relaxation of muscles. 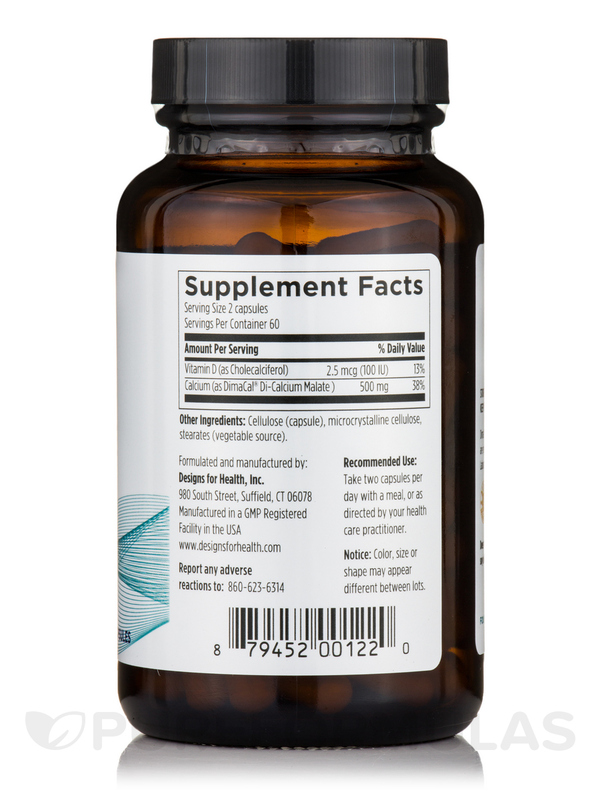 Treatment with a calcium supplement such as calcium citrate malate helps boost your calcium levels; it may also help prevent or treat health conditions like high blood pressure‚ osteoporosis‚ premenstrual syndrome (PMS)‚ rickets‚ high cholesterol‚ obesity and hypoparathyroidism (a condition characterized by abnormally low levels of the parathyroid hormone). Studies are ongoing and seek to explore further uses for calcium supplements. 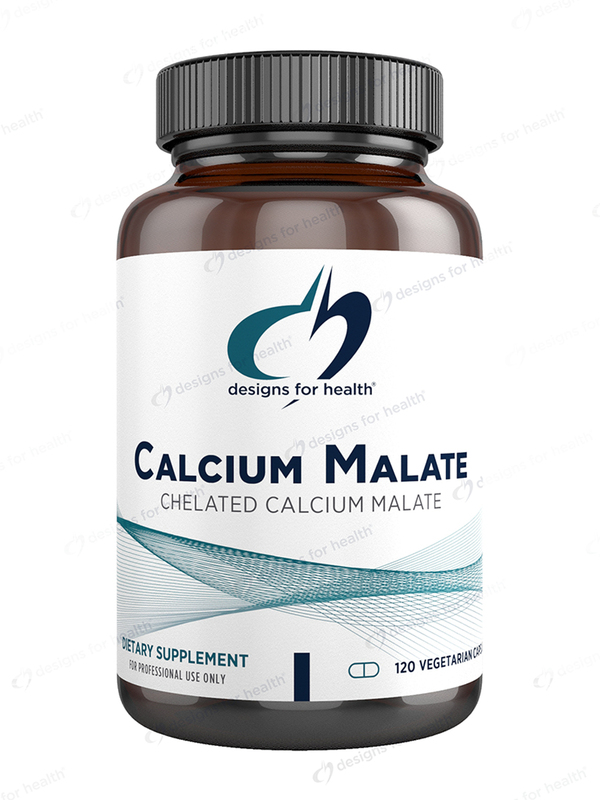 Calcium malate chelate is different from other supplements in that it’s a formulation in which calcium and malic acid are bonded to each other‚ which enhances absorption by your body. Malic acid is contained in its natural form by fruits and vegetables‚ including apples. 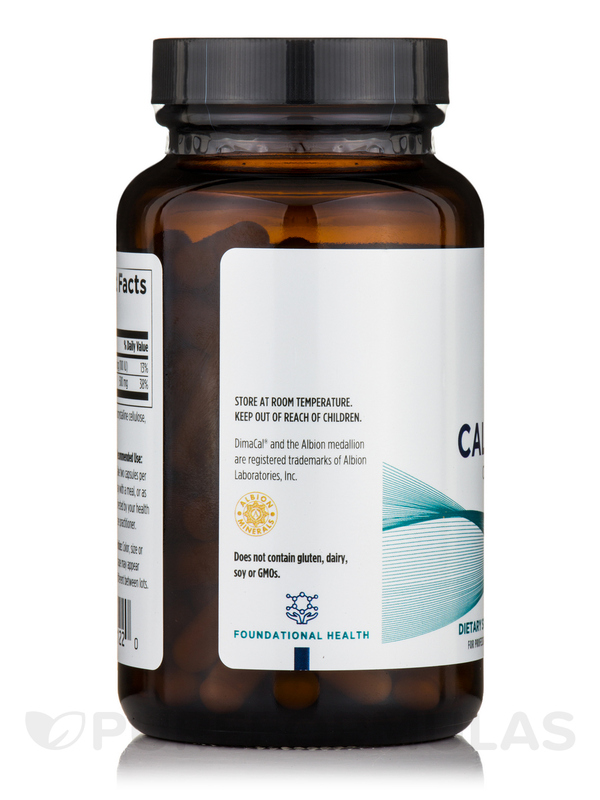 Through the process of chelation‚ Calcium Malate Chelate Vegetarian Capsules by Designs for Health has been manufactured to have a larger absorption rate than calcium carbonate‚ calcium citrate‚ and calcium hydroxyapatite. Most impressively‚ calcium malate chelate has even been shown to be absorbed by the body than the calcium from milk! Other Ingredients: Cellulose (capsule)‚ microcrystalline cellulose‚ stearates (vegetable source). Calcium Malate by Designs for Health is a nice complement to magnesium malate. I am very sensitive to supplements. The Malate form of Calcium has been quite calming to my body systems. I appreciate how clean Calcium Malate by Designs for Health is and Thank You for keeping any for of silica out of it !! This is a very clean product without any extra fillers. It is challenging to find ones without silica in some form - with autoimmune problems this is a must for me. I was looking for calcium supplement in vegan form and Calcium Malate by Designs for Health fits the bill. It helps my nail grow stronger and maintain my bone health at the age of 32. 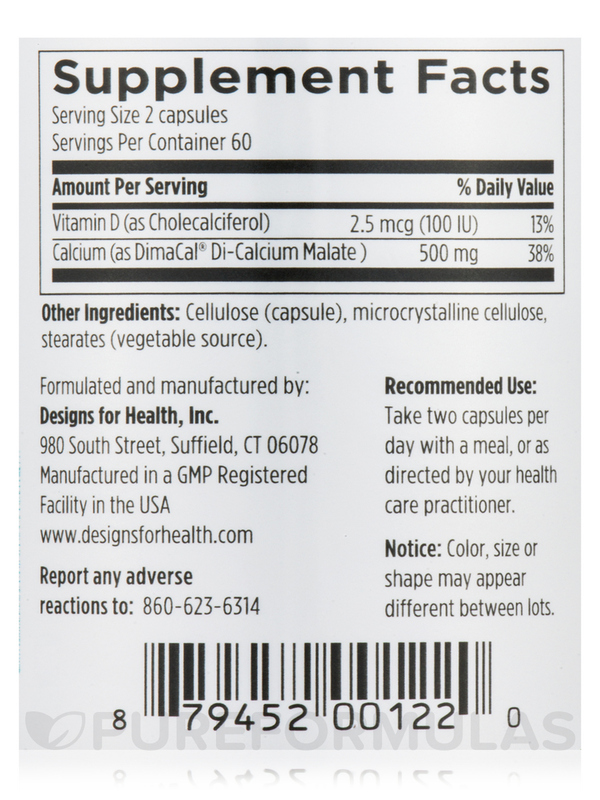 Calcium Malate by Designs for Health has a good combination and dosage, no need to take 2 separate pills. It helps my nail grow much more thick and strong. Just started on this one! Nothing so far. Just started so will have to give it some time. Calcium Malete is a great product. Have had good luck with using Calcium Malate-Chelate by Designs for Health. Will be ordering this on a regular basis. Calcium Malate Chelate must work. My doctor prescribed this brand and the dosage. I am a 60 year old female who roller blades and is very active and very clumsy....I trip over everything and fall all the time....have never broken a bone and my bone density is great .....I have to contribute credit to Calcium Malate Chelate at helping keep my bones in working order. Calcium Malate Chelate is a high quality calcium and s easy to take. I have been using this calcium for two years and will continue to order this product.